India made headlines in late September after carrying out "surgical strikes" on militants across the de-facto border in disputed Kashmir. Days earlier insurgents had attacked an army base in Indian-administered Kashmir, killing 18 soldiers. Tensions spiked as India blamed Pakistan. Supporters of the Indian government said the army's strikes had taught Pakistan a long-awaited lesson - but Islamabad dismissed the reports as an "illusion". The BBC's M Ilyas Khan visited the border area to find out what actually happened. What did Indian troops do? Despite the use of the term "surgical strikes", the Indians definitely did not airdrop commandos to hit "launching pads of militants" inside Pakistani-held territory, or conduct ground assaults deep into the Pakistan-administered side. But they did cross the Line of Control (LoC), in some cases by more than a kilometre, to hit nearby Pakistani border posts. Police officials on the Pakistani side privately concede that such a ground assault did occur in the Madarpur-Titrinot region of Poonch sector, west of Srinagar, where a Pakistani post was destroyed and one soldier killed. In Leepa valley to the north, locals said that the Indians crossed the LoC and set up their guns on ridges directly overlooking the village of Mundakali. A Pakistani border post located at some distance east of the village was hit. Two other posts higher up in the mountains were also hit. 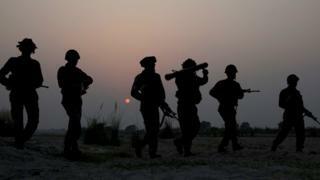 At least four Pakistani soldiers were injured in the attack, which lasted from 05:00am until 8:00am, locals said. Image caption The Leepa valley. A route across the centre of the mountain-top shown was previously used by militants to cross into India, until the border was fenced. A similar advance by the Indians in the Dudhnial area of Neelum valley further north was beaten back by the Pakistanis. At least one Pakistani soldier was injured - reports of a dead soldier could not be independently verified by the BBC. The Pakistani army described the exchanges as nothing more than cross-border firing, albeit in a more co-ordinated fashion and all along the LoC. Officials said two soldiers were killed in the attacks - one in Poonch, and one in Bhimber sector, further south. Defence minister Khwaja Asif later said a total of nine soldiers were injured in the assault. Indian troops could not have hit a target and returned alive as the climb required was too steep, officials said. Nor could helicopters have been used to drop special forces given the difficult terrain and because Pakistan would have shot down the aircraft. There is no conclusive evidence to prove either side's claims - the truth probably lies somewhere in the middle. I normally wake up at 4:30am. As usual I did my chores - and just then I heard small arms fire, about 100 rounds. I waited a few minutes and then I heard four bombs [mortars] land near the village. We have been in a state of war for a long time, so I knew that heavy guns meant trouble and that the village might get hit. I was standing there when four more bombs came. Then four more, after a few minutes. The first shells had landed in the forest near the village [where a border post is located] and I saw flames and smoke rising. My wife called to me to get in. We have built a bunker in the basement with 24-inch thick walls. She said everybody was inside, and wanted me to get in too. By now they had started targeting another one of our posts higher up on the mountaintop in front. Then the next round of shells hit another post further back. Small arms fire also continued. This was surprising for me. They had apparently crossed over from the LoC and had set up their guns at the top of the cliff. I could heard the bullets whizzing overhead, through the treetops, snapping twigs and leaves that were falling to the ground. The firing continued until about 6am. After that, the heavy guns fell silent but small fire continued. We remained in our basement until 10am. No one had had time to eat or drink that morning. Later, we heard that the Indians had crossed the LoC and hit our posts from positions overlooking the valley. I don't understand why they didn't try to reach our post where we have the local company headquarters. They could have done it. It's walkable, and is easier for them because they occupy higher ground. Perhaps our people detected their movement and fired at them which pushed them back. This is the first time since the war on the LoC began nearly 30 years ago that they have fired from this position. How did the Pakistanis respond? In many areas the attack came as a surprise. Accounts of villagers gathered in Leepa suggest that Indian soldiers first opened fire in the valley at around 0500, hitting the post near Mundakali village and blowing up a mosque adjacent to it. A soldier who was preparing for pre-dawn prayers was hit and injured, they said. Fire was also directed at two other posts higher up in the hills, one of which served as the forward headquarters in Leepa. Locals say bunkers at these posts were partly destroyed and their communication system was paralysed for some time. This meant that troops stationed down in the valley and at the brigade headquarters took a while to realise what was going on. The soldier who was injured at the Mundakali post was given first aid by villagers, and then transported to the military-run hospital in Leepa on a motorbike. Nearly two dozen villagers helped put out the fire that had engulfed the mosque. The Pakistanis did not take long to get their act together and fired back from the remaining bunkers, pushing the Indian guns back from the ridges overlooking the valley. In Dudhnial in Neelum valley, the action took place further up in the mountains, away from the village. A few villagers were awakened by gunfire. An official familiar with what happened that morning said the Indians had advanced well beyond the LoC when their movements were detected. "The Pakistani fire sent them scurrying back to their bunkers," he said. Down south, in Poonch, Kotli and Bhimber areas, it was more or less the same story: Indians coming forward from their positions on the LoC, taking unsuspecting Pakistani soldiers by surprise both due to the suddenness of the attack and the intensity of the fire and then pulling back once the Pakistanis had a chance to respond. Unprepared, and having a numerical disadvantage generally, the Pakistanis made use of their firepower to the fullest, exhausting their ammunition. Locals said that in the days following the attack, hundreds of villagers were pressed into service carrying artillery shells and other ammunition to border posts to replenish their supplies. Kashmir-focused militants have had a strong presence in Pakistani-administered Kashmir for years. During the 1990s they crossed the LoC in droves to ambush troops on India's side. Their activities became less visible after the 2003 ceasefire agreement between India and Pakistan, but their proficiency in suicide raids and other attacks kept them relevant to Pakistan's strategy in its dispute with India, despite denials from Pakistan's military. The militants continue to maintain safe houses in bigger cities like Muzaffarabad, located some distance from the border area. But they now mostly set up camps near military deployments along the LoC and away from villages where there is a growing sense of fatigue among locals towards the insurgency. Despite the claims in the Indian media, the BBC could find little evidence that militants had been hit. There were no reports of any of the camps in the Samahni area of Bhimber or in the Poonch-Kotli area having been hit. They are mostly located behind ridges that serve as a natural barrier against direct Indian fire. In Leepa, some five or six wooden structures housing militants between the villages of Channian and Mundakali had not been targeted. A ridge that runs along the east bank of the nearby stream covers them from military positions on the LoC. Likewise, in Neelum, most militant camps - such as the ones at Jhambar, Dosut and in the Gurez valley area further east - are located in the valleys below, at a safe distance from the LoC. The BBC also could not confirm an Indian media report that Lashkar-e-Taiba camps in the Khairati Bagh village of Leepa valley and the western end of Dudhnial village in Neelum valley had been hit on 29 September. However, in Dudhnial some locals who helped carry military munitions to forward posts the weekend following the Indian strikes said they had seen one or two damaged structures close to a Pakistani post near the border. They thought those structures might have been hit on the morning of 29 September. But they were reluctant to discuss whether those structures had been occupied by militants, or whether five or six men had died there, as the Indian media had claimed. The BBC asked the Pakistani military about militant activity in the area, but there was no immediate response. What is the mood now? Since 29 September there has been no let up in tension in the LoC area. Locals in Leepa told the BBC that following the attack, there had been an increased influx of militants in the valley. Are they in the area to help the army in case border skirmishes with the Indians get worse? No one is sure. In Neelum, a top official of the district administration called a meeting and advised locals earlier this month to start digging bunkers in or near their houses in case border tensions escalate. A local school teacher who was at the meeting said the official was told that removing militants from the area would be a simpler and less costly option to protect villages from Indian shelling. The strategy was a confidential matter, the official responded. It would be up to the government to decide.